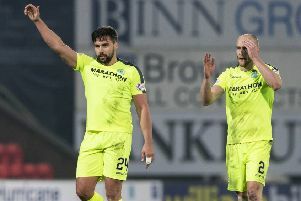 Hibs boss Alan Stubbs today revealed he hopes to have both Paul Hanlon and Liam Henderson back in his squad at Morton tomorrow week as the Easter Road outfit seek to extend their unbeaten 15-match run. Central defender Hanlon has missed the Edinburgh club’s last two games with a hamstring problem while midfielder Henderson sat out the trip to Alloa having been hit by a mystery virus. Now, though, Hanlon is expected to rejoin his team-mates in Monday’s training session while on-loan Celtic kid Henderson is showing signs of improvement having been “wiped out” by his illness and, depending on how he progresses, would hope to join in during the week.